Vybz Kartel promises his fans that he will still be dropping new music despite being transfer to confinement at GP. The “Dancehall Hero” deejay was abruptly transferred from the Horizon Remand Center to the Tower Street Adult Correctional Centre. Authorities have yet to provide a reason for his transfer but sources are saying that he is being investigated for allegedly recording music in prison. A rep for the deejay told Urban Islandz that the music will keep coming because of his massive catalog of unreleased material. “Transfer from one prison to the next won’t stop the music because we have so much unreleased recordings,” his rep told us. “We have really good producers who can mix the songs to make them sound like they were just recorded so that is the issue now, but no music is being recorded behind bars,” the deejay’s rep added. 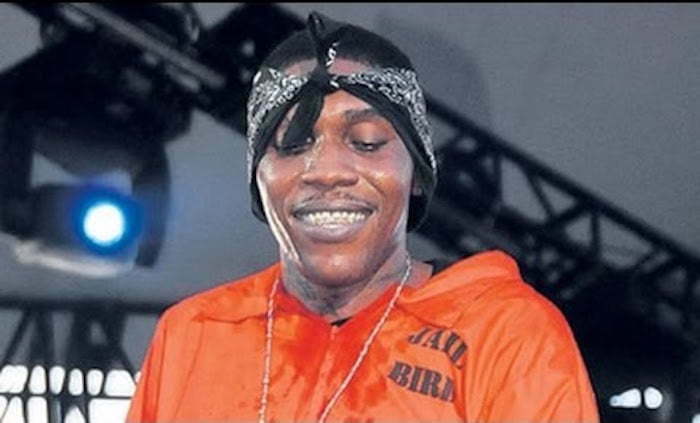 During his sentencing in 2014, Vybz Kartel was given the option to record music in prison but the proceeds would go towards his murder victim family. The Portmore Empire deejay declined the offer which means its illegal for him to record music in prison. Since last week, Vybz Kartel has released three new singles, “You Make Me Cry,” “Your Little Shorts,” and “What Next.” We’re told that all these tracks are from previously recorded unreleased material. weh mi a seh free kartel mi nah fi listen crap from gullyside cyaa dem git nah badi win a Gaza reckoning strie.